Does Plastic Surgery Cause Hair Loss? Video Question: Does Plastic Surgery Cause Hair Loss? The Top 3 Hair Loss Problems After Plastic and Cosmetic Surgery are discussed in this BeckyinBoca video segment below with renowned Hair Restoration Physician from Boca Raton, Florida, Dr. Alan J. Bauman, M.D. No cosmetic surgery procedure is complete without considering the effects of HAIR on the patient’s overall appearance. Transforming the face to a more youthful, healthier look is a challenging task for any surgeon who performs an aesthetic procedure. Achieving this end, while also avoiding any appearance of artificiality in the design, is what defines a procedure as aesthetically superior for both physicians and patients. To this end, there has been a growing awareness in the medical community—and among patients—that hair loss can detrimentally affect the overall desired short- and long-term outcome of facial-rejuvenation procedures. By some estimates, genetic male and female hair loss affects between 60 and 100 million Americans.1–4 It is expected, therefore, that a significant number of aesthetic surgery patients will experience some degree of hereditary hair loss before or after their procedures. In addition, some hairline changes (such as hairline recession and sideburn distortion) and visible scarring can result directly from even the most well-planned and well-executed rhytidectomy or brow lift. Sometimes just the use of general anesthesia can cause a concerning shedding of hair or effluvium in the first few weeks or months after plastic surgery. For this reason, it is important that a plastic surgeon—who may not routinely perform hair restoration—consider consulting with a hair restoration physician before and after the patient’s surgery. In this way, the surgeon can help his or her patient avoid unanticipated hair-related issues later on. When it comes to the face, aesthetic surgery and hair restoration share the same fundamental goal: to restore a healthy, youthful look. Whereas plastic surgery secures its objective quite directly by “turning back the clock” on visual signs of aging by enhancing lost volume, surgically removing excess fat, tightening underlying muscles, and redraping skin, hair-restoration surgery achieves this goal more obliquely, by restoring and or maintaining the visual “frame” of the face and youthful coverage of the scalp (Figure 1). Hair shapes a person’s face—and hairlines and hairstyles accentuate key physical features of the face and body, whether good or bad. Body weight, bone structure, skin tone, and age can all be magnified or de-emphasized by the quality, quantity, shape, color, and cut of a person’s hair. For men and women, hair loss is often an unwanted sign of aging, and is commonly equated with significant decreases in self-esteem and self-confidence.5 As any hairstylist, cosmetologist, or fashion expert will tell you: Hair has a lot to do with whether we look old or young. Therefore, restoring the face to a healthy, youthful appearance requires a multidisciplinary approach in which hair restoration is often a critical component. If questions or concerns exist regarding an aesthetic plastic surgery patient’s current or future hair-loss status, or the effect a particular procedure might have on the hairline or frame of the face, a hair-restoration surgeon can be a valuable resource. • What steps can be taken to prevent or reverse any unwanted changes. A skilled hair-restoration surgeon can, if necessary, restore hairlines, improve coverage, reconstruct sideburns, and help camouflage scarring or other undesirable surgical stigmata postoperatively. Some readers will remember the infamous “hair-plug” days of early hair restoration, but this medical field has rapidly evolved in recent years to become a detailed science all its own. New technologies, advanced procedures, and cutting-edge research have dramatically changed hair restoration from the more primitive procedures of the 1970s and 1980s to a mature medical discipline whose results can be as consistently natural and undetectable as the result of a well-planned and well-executed facial-rejuvenation procedure. Much of the advancement in the field of hair restoration has been fostered by educational opportunities spearheaded by the International Society of Hair Restoration Surgery (ISHRS; www.ishrs.org.). With more than 700 members in 50 countries, the ISHRS is the largest organization of its kind—it hosts annual meetings, annual live-surgery workshops, and regional workshops; supports clinical research and pro bono work; and publishes the only journal dedicated exclusively to hair-restoration surgery: Hair Transplant Forum International. • Follicular-unit micrografts. Follicular-unit micrografting or FUT Follicular Unit Transplantation is an advanced surgical procedure in which literally thousands of individual skin grafts are transplanted in a single session. Grafts containing naturally occurring follicular units (one to four hairs each) are microscopically dissected from the harvested donor tissue and then transplanted to the thinning or balding areas. The availability of small, exceptionally sharp, customized blades enables dense placement and precise angulation of the transplanted grafts. A surgeon’s appreciation for natural hair-growth patterns, along with meticulous planning and design, is critical to the aesthetic outcome. • Trichophytic donor closure. A special intraoperative surgical modification of the edge of the linear donor defect prior to suturing allows hair to grow through the resulting scar. This enables better camouflage of the linear donor scar, even with shorter hairstyles when old-style linear or strip harvesting is used. • Follicular-unit extraction or FUE. This is a minimally invasive, albeit labor-intensive, alternative to micrografting in which donor follicles are harvested without a scalpel, stitches, or linear scar. Using alternating sharp- and blunt-dissecting micropunches ( <1 mm in diameter), follicular units are gently extracted from the donor area one at a time. The promise of quicker recovery and “buzzcuts” are making this procedure an attractive option for younger male patients. • Computerized diagnostics and imaging. The use of PC-based or phone-based video microscopy and dermoscopy is available for hair-loss diagnosis and patient education.8 These devices can measure and track hair density and hair caliber before these changes are noticeable to the naked eye. Also, sophisticated digital “preview” imaging can facilitate realistic expectations of what a procedure or treatment can—or cannot—provide. • Low-level laser therapy. The use of low-power lasers for healing and hair growth is gaining momentum with the advent of FDA-cleared devices which have double-blind scientific trials to support their “hair growth” claims. • Healing Treatments. Procedures such as copper–peptide soaks, nutritional supplements, hyperbaric oxygen therapy, PRP Platelet Rich Plasma, and low-level laser therapy can help decrease “cosmetic downtime” and postoperative discomfort. • Computerized local anesthesia. Originally developed for dentists, these relatively painless, computerized anesthetic injection devices—often combined with mechanical vibration techniques and local anesthetic gels—are used by many hair-restoration physicians who are becoming increasingly focused on patient comfort. As seen below, hairline lowering with hair transplantation can provide a more feminine and aesthetically appealing look for many women with high hairlines due to heredity or plastic surgery like a brow lift without the risks or prolonged recovery of other options. 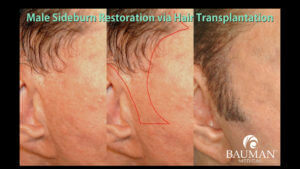 Female hairline lowering by Dr. Alan Bauman using no-scalpel, no-stitch FUE-style hair transplant harvesting technique. Before, 1-Day and 12-Months After. Although few patients realize it, receding hairlines and hair loss are factors that can undermine the outcome of almost any facial-rejuvenation surgery. It is therefore important for plastic surgeons to consider the potential likelihood of hereditary hair loss in their patients when they perform the preliminary physical exam and family-history review. It is also ethically responsible to discuss any effects the proposed procedure might have on the patient’s hairline and scalp—including potential scarring—prior to performing the proposed procedure as part of the informed-consent process. The vast majority of hair loss is genetic (androgenic alopecia). But hair loss can also be caused by an autoimmune disorder (alopecia areata) or a temporary condition (telogen effluvium) triggered by excessive physical or emotional stress or general anesthesia. In women, changing hormone levels—such as those that occur with childbirth and menopause—can trigger hair loss as well. Certain medications, illnesses, and skin disorders can also be responsible. In addition to these biological causes, the basic mechanics of some plastic surgery procedures can lead to—or exacerbate—hair loss. For example, the lift of an already high or receding hairline in brow lift patients can accentuate or reveal a patient’s tendency toward hair loss. Significant recession of a woman’s frontal hairline may also lend an undesirable, masculine proportion to the face. Scars that were easily hidden at middle age when the brow lift was performed, may now become visible a decade later when hereditary hair loss progresses in the temple and frontal areas of the scalp. A hair-restoration surgeon can help accurately assess a patient’s risk factors and propose helpful preventive and restorative procedures, if necessary. For example, one preventive measure that is quite easy for female patients to use before and after surgery is the application of a topical minoxidil solution. Researchers at the University of California, Los Angeles, medical school’s dermatology division observed 60 female patients who used 2% or 5% topical minoxidil 2 weeks prior to and 4 weeks after facelift surgery.10 They found that using minoxidil significantly reduced the risk of hair loss following surgery. In fact, only one patient experienced temporary postoperative hair loss. No matter how expertly a facelift or brow lift is performed, there is always the possibility of hairline distortion, which may include the frontal, temporal, or sideburn areas. Although the degree of the distortion can be reduced by careful preoperative planning and technique, sometimes it cannot be avoided altogether. In addition, patients may not necessarily notice hairline changes or decreases in coverage until years later, when their genetic hair loss progresses. For example, scars hidden for years after surgery may begin to “shine through” as hair volume diminishes. It is prudent, therefore, for plastic surgeons to consult with hair-restoration surgeons to mitigate these unsightly effects that have the potential to become visible months or years after the facial-rejuvenation surgery. Hairline distortion can be caused by coronal brow lifts and less-invasive endoscopic brow lifts. It is only natural that the patient’s hairline will move upward with any incision within the hairline and subsequent redraping of the brow. This higher, or receded, hairline may upset the visual frame of the face, and can potentially create a less youthful or potentially artificial appearance. This unfortunate consequence is particularly distressing to women who may already have high or receded hairlines prior to surgery. In some cases, further recession of a female hairline may result in a less feminine proportion to the face. The importance of consulting with a hair-restoration surgeon cannot be overstated for plastic surgery patients who already have slightly recessed hairlines or thin, sparse hair. For these patients, any scarring that may result from coronal lifts or even endoscopic procedures can be difficult to conceal because of the poor quality of their hair. As a result, even minimal brow lift scarring can sometimes remain painfully visible or difficult to hide years later if genetic hair loss occurs (Figure 2). Often, frontal hair density is lower in front of brow-lift scars and endoscopic entry points than areas farther back on the scalp. Scarring at the nape of the neck can also potentially become unwanted surgical stigmata and telltale sign of plastic surgery in women who desire to wear their hair in an up-swept hairdo. “Sue,” a 52-year-old patient, sought evaluation and treatment for her receded hairline and hair thinning. During her initial consultation, I learned that she had a high forehead since her youth, she had a family history of female hair loss (mother and grandmother), and she had a traditional incision-based brow-lift procedure approximately 6 years earlier. She was concerned that additional hair loss would further reveal her brow-lift scars, which were already somewhat visible in the frontal and temporal areas. Sue had not previously had any hair-loss treatments or procedures, and she was also interested in restoring her hairline to a lower position. It was noted on examination that the density and caliber of hair in front of her brow-lift scars were quite low—especially when compared to her donor area—and did not provide complete coverage without “creative” hairstyling. The treatment plan for Sue included a session of follicular-unit micrografting to restore a lower hairline, improve frontal and temporal density, and cover the residual brow-lift scars. The surgical plan called for one session of approximately 1,500 follicular-unit micrografts. One- and two-hair units were used at the new frontal hairline; three- and four-hair units were placed behind the hairline and through the temples, frontal area, and brow-lift scars. Sue was instructed to begin to use minoxidil at the time of her consultation; however, she declined its use due to difficulty with hairstyling. In addition, it was recommended that she participate in a regimen of low-level laser therapy after her hair transplant to encourage improved growth from her existing, but miniaturizing, frontal hair. Within 12 months of the microsurgical procedure, Sue had achieved approximately 90% of the desired aesthetic result. Treatment successfully restored a natural hairline to a lower youthful and feminine position on the scalp, and succeeded in improving density and adequately covering her brow-lift scars. A highly effective camouflage of this type of scarring is hair transplantation. By lowering the hairline, improving the density in a thinning area, or transplanting follicles directly into the scar, a hair-restoration surgeon can create a natural concealment for this otherwise potentially embarrassing look. As the popularity of aesthetic plastic surgery continues to grow, it is important for practitioners to embrace a new level of coordination with related disciplines, such as hair-restoration surgery. By working with a hair-restoration surgeon, a plastic surgeon can more accurately predict, preempt, and correct any potential unwanted hair changes for his or her patients. A hair-restoration surgeon’s specialized skills, artistry, and advanced techniques can create very satisfying results for patients. These practitioners can recreate natural-looking hairlines, sideburns, and hair density to properly frame the face for a youthful, healthy look. Shortly after a rhytidectomy, 61-year-old “Betty” was left with a nearly complete loss of her sideburns—commonly referred to as the “windswept” or “Palm Beach pulled” look—and a nonfading surgical scar. This surgical stigma limited Betty’s hairstyling options and also made her exceptionally self-conscious about performing the uniquely feminine gesture of placing her hair behind her ear. After consultation, a session of hair transplantation using follicular-unit micrografts was performed to restore the small sideburns bilaterally and cover the post–plastic surgery scars. 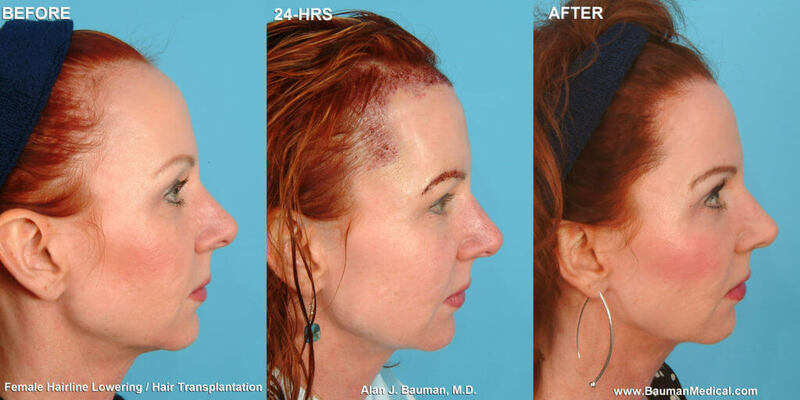 The surgical plan consisted of one session of approximately 900 follicular-unit micrografts (450 per side). One- and two-hair follicular units were used at the hairline and sideburn areas; and three- and four-hair units were placed behind the hairline, in the temples, and in the facelift scars. Her “before” status, surgical plan, and resulting growth (including camouflage of the rhytidectomy scar) are shown in the figure. 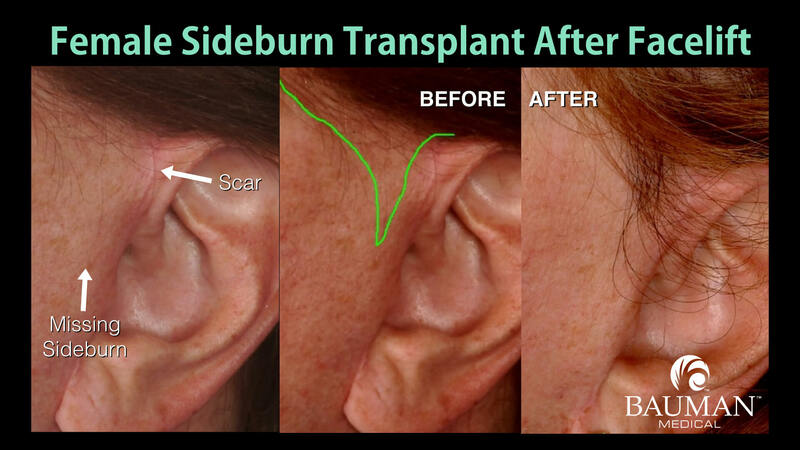 “John,” a 56-year-old man, years after multiple rhytidectomies and total sideburn loss, became interested in bilateral sideburn restoration. Approximately 350 follicular-unit grafts per side were used to restore the sideburns and cover the scars that were becoming visible above the ears. One- and two-hair follicular units were used at the hairline and edges of the sideburn area; and three- and four-hair units were placed behind the hairline, between follicles in the temples, and into the facelift scars. See the figure for his preoperative appearance, the surgical plan, his postoperative appearance, and a close-up of the transplant results. Alan J. Bauman, MD, is the founder and medical director of Bauman Medical Group since 1997 in Boca Raton, FL. He is a graduate of New York Medical College and had internship and residency training in general surgery at Beth Israel Medical Center and Mt Sinai Medical Center in New York City before training as a hair restoration physician. He can be reached at (561) 394-0024 or baumanmedical.com. 1. Hamilton JB. Patterned loss of hair in men: Types and incidence. Ann NY Acad Sci. 1951;53:708–728. 3. Rhodes T. Prevalence of male pattern hair loss in 18–49 year old men. Dermatol Surg. 1998;24:1330–1332. 4. Olsen EA. Female pattern hair loss. J Am Acad Dermatol. 2001;43: S70–S80. 5. Cash TF. The psychology of hair loss and its implications for patient care. Clin Dermatol. 2001;19:161–166. 6. International Society of Hair Restoration Surgery. 2005 Practice Census. Available at: www.ishrs.org/PDF/ISHRS2005PracticeCensusReportFINAL10.23.05.pdf . Accessed July 10, 2006. 7. American Academy of Cosmetic Surgery. 2005 Procedural Census. Available at: www.cosmeticsurgery.org/media/aacs%202005%20procedural%20stats.pdf . Accessed July 10, 2006. 8. Bauman AJ. First impressions of the Capillicare® hair and scalp analysis machine in early androgenetic alopecia. Hair Transplant Forum Intl.2001;11(3): 71–72. 9. Tuner J, Hode L. Laser Therapy—Clinical Practice and Scientific Background. Grangesburg, Sweden: Prima Books; 2000:206. 10. Eremia S, Umar SH, Li CY. Prevention of temporal alopecia following rhytidectomy: the prophylactic use of minoxidil. A study of 60 patients.Dermatol Surg. 2002;28:66–74. 11. Juri J, Juri C, de Anueno J. Reconstruction of the sideburn for alopecia after rhytidectomy. Plast Reconstr Surg. 1976;57:304–307. 12. Epstein JS. Hair transplantation in women: Treating female pattern baldness and repairing distortion and scarring from prior cosmetic surgery.Arch Facial Plast Surg. 2003;5:121–126. Copyright © 2006 Ascend Media LLC | PLASTIC SURGERY PRODUCTS | All Rights Reserved.